The wood lilies need good leafy soil, in part shade conditions, under deciduous trees or shrubs. They are from North America and usually very hardy. 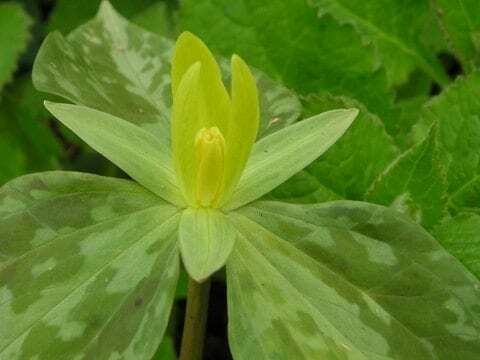 Trillium luteum has waxy yellowy-green flowers, held tight in the leaf axil, with a paler green mottling on the leaf and brown stems. It has one of the longest flowering period of any Trillium, lasting for several weeks. AGM. Hardiness rating H5. All Trilliums are supplied with a care sheet.